i suppose i better go first seeing as i started the thread! well my english cocker spaniel is called ruby and she will be 1yr old in march. she is blue roan and tan. i have had her since she was 8wks old. 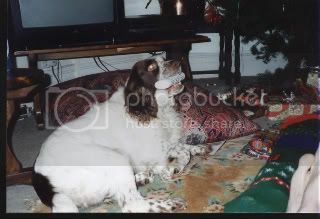 My wife and I are huge fans of spaniels, that's why we have Japser (picture under my username). We have had him since he was 8 weeks and he is now 16 months. I find spaniels great to train cos they will do anything for food!!!!! I read some where that it was only just over one hundred years ago when cockers and springers were officially recognised as different breeds. I have another picture of him but it is too big to attach it and i'm not sure how to resize it!!!! The 600 x 450 is usually a good size. Ahh. Ive found a thread to voice my problem. My family are looking for a Cocker / Cavalier King Charles Spaniel to join our family. We want it to be a rescue dog, preferably between the ages of 1-6, and it MUST MUST be good with tiny children and older children, other dogs, ect. I enjoy walking and I want a dog thats energetic enough to walk about for a few hours with me every afternoon, with my friend as his cocker. Our problem is, A lot of spaniel rescues are too far away. We just cant find one close enough so that its possible to build a bond with the dog before it comes home. We are in Hampshire, near Portsmouth. Anyone know of anywhere or anyone that are close enough who rehome the breeds that we like? Please help us, the home is so lonely without a dog ! 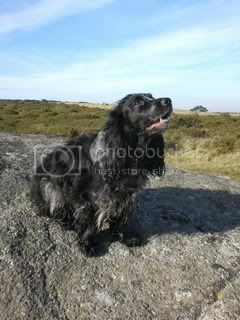 Have you been on the specialised spaniel forum in the UK? They have a section on rehoming of spaniels and a lot of the spaniel welfare reps are on there, it will be the best place for you to get help. I've PM'ed you the address, sign up and see if they can help. PS Mermaid I never noticed this before, can't be letting Molly miss out on a Cocker thread! She'd never forgive me. For those that don't know, I have a rascal cocker called Molly who is a demanding MADAM and tells everyone what to do. She's also the funniest, most 'human-like' dog I've had, and the only one Ive known to sulk! I love her dearly and she is the darling of the entire family. She's a little accident prone as other DF members can back up (it was a snake bite last). 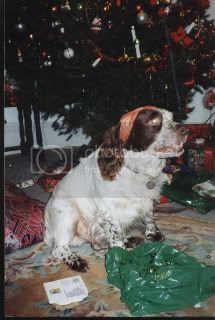 I also had a rescue springer spaniel called Tizzy for 8 years before Molly, he was a dog in a million and dearly missed. He was without a doubt the best dog I've ever known and utterly irreplaceable. 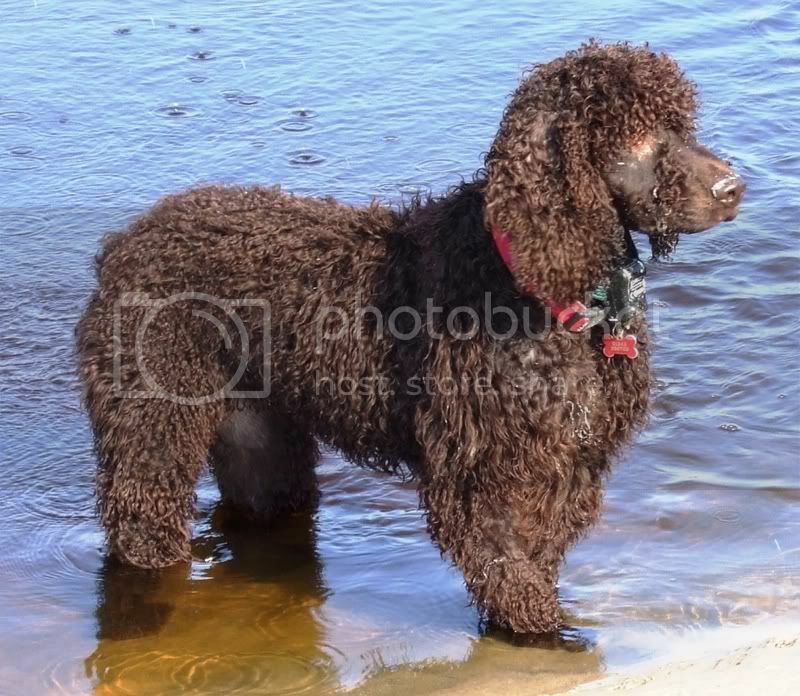 Why is it that spaniel forums never include Irish Water Spaniels? I know that you would not deliberately exclude Jake or me. Mel, I've applied to join the specialised spaniel forum and I've had to provide a lot of information, and I've also been asked what I can contribute to the forum.I don't even know if I've been accepted. Humph! 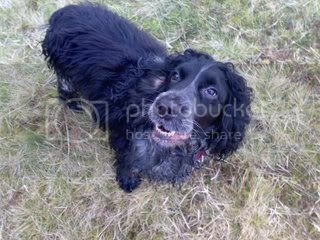 Our Ted is a 1 year old springer spaniel we have rehomed just over a month ago. Yes true to form he has lots and lots of spring, but is absolutely the best dog for temperament and to train. Of course Ted also loves his walks on nearby NT land where he socialises with lots of his very nice doggy friends.